The social costs of road crashes in the Netherlands in 2015 are estimated at 14 billion euro (between €13.0 and €15.4 billion euro), about 2% of the gross domestic product (GDP). This is significantly higher than other traffic-related social costs such as traffic congestion (€2.3 to €3 billion) and environmental damage (€4.8 billion). The costs per road death amount to about €2.9 million and about €310,000 per serious road injury. The proportion of serious road injuries in the total costs has increased from 38% in 2003 to about 45% in 2015. The share of road deaths in 2015 is relatively low (an estimated 13%) as in 2003 it still was 21%. The other costs (42% in 2015) are the result of road crashes with less severe outcome. Approximately half of the total costs are human costs and also the damage to vehicles is relatively high (about 30% of the total costs). Other cost items are medical expenses, loss of production, settlement costs and congestion costs. In the Netherlands, the cost of road crashes is higher than in most other European countries. In Europe, the costs range from 0.4% to 4.1% of the GDP. The differences are mainly explained by differences in methods to determine the costs. Information about the costs of road crashes is used in, for example, preparation and evaluation of road safety policy and in cost-benefit analyses of road safety measures. What are the costs of road crashes for society? The social costs of road crashes in 2015 are estimated at 14 billion euro (€13.0 to €15.4 billion) ). This is about 2% of the gross domestic product. The costs per road death are about €2.9 million and about €310,000 per serious road injury. Almost half of the total costs of road crashes (about 45%) is attributable to serious road injuries, while the share attributable to road deaths is relatively low (an estimated 13%). Slightly injured casualties (treated in the A&E department of a hospital) and other injured each have a share of about 7%, and 28% of the cost is attributable to crashes with property damage only, see Figure 1. The costs are both 'hard' economic costs – such as medical expenses and damage to vehicles – and human costs. These intangible costs involve loss of life years and quality of life. Almost half the total costs are human costs. Figure 1. 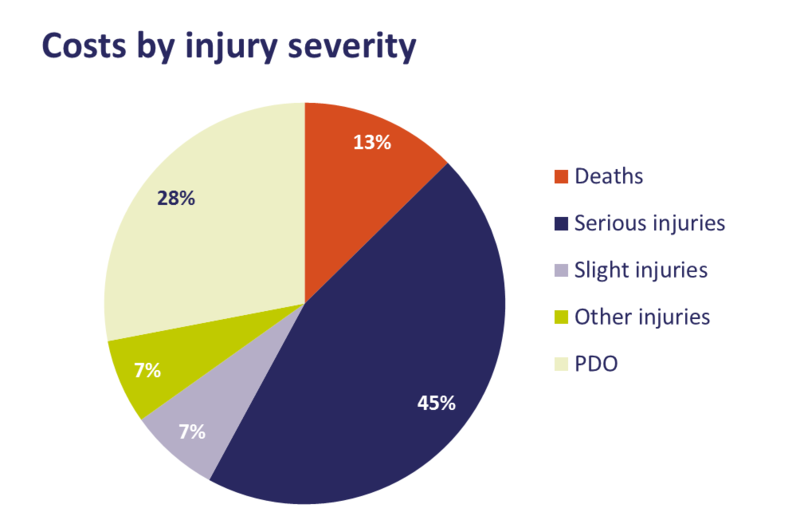 Proportions of deaths, serious/slight/other injuries and property damage only crashes of the total road crash costs (2015; PDO = property damage only). Source: KiM. The data for 2015 are a simple update of the costs in 2009, the most recent year for which the costs were examined in detail . To estimate the costs in 2015, the cost in 2009 (€12.5 billion) were adapted to the development of the number of casualties and to inflation. An (arbitrary) uncertainty margin of 20% was used for the number of serious and light injuries and property damage only crashes. This margin has resulted in the bandwidth of €13.0 to €15.4 billion in total costs in 2015 . The data only includes costs that are due to road crashes. In 2007, costs made to prevent crashes were approximately €2.3 billion to €3.1 billion . More recent estimates of these costs are not available. How did the costs develop in recent years? Figure 2. Development of the costs of road crashes (billion euros, current prices; PDO = property damage only). Source: KiM. In 2015, the costs of road crashes are higher than in previous years (see Figure 2). This is almost entirely attributable to inflation. If we leave this outside consideration, the costs in 2015 are about equal to the costs in other years. An exception are the costs in 2006 which are considerably lower; in that year the number of serious road injuries was lower. The proportion of deaths in the total costs has gradually been decreasing (from 21% in 2003 to about 13% in 2015), whereas the share of serious road injuries has been increasing (from 38% in 2003 to about 45% in 2015). The estimates for 2015 are a fairly rough indication, because after 2009 no extensive study has been made of the costs of road crashes. The costs in 2015 have been estimated in a simple way by adapting the costs in 2009 to the development of the number of casualties and to inflation. What types of road crash costs do we distinguish? Figure 3. Estimated proportions of the total costs of road crashes in 2015 for the various cost items[i]. Source: KiM. Medical costs are the result of the medical treatment of casualties, for example costs for hospital, rehabilitation and medicines. In the Netherlands costs for people who come to visit in hospital and (early) funeral expenses are also included in medical expenses. Loss of production consists of costs of temporary or permanent inability to work of the casualties and the entire loss of production of road deaths. Some countries also include loss of unpaid production, such as housekeeping and voluntary work, costs for employers to recruit and train replacement staff, and cost of vocational rehabilitation. However, these costs are not included in the Netherlands. Human costs of casualties and their relatives and friends are costs in the form of suffering, pain, sorrow and loss of quality of life and joy of life. In principle, human costs are related to road deaths as well as to serious and slightly injured. 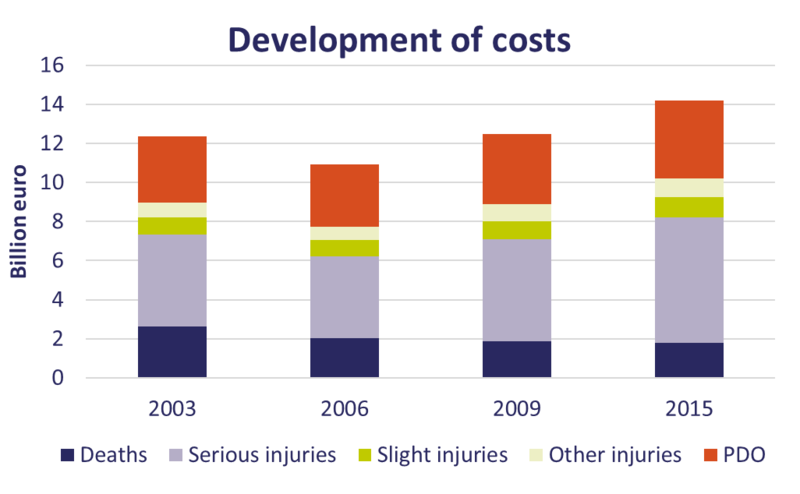 However, unlike in many other countries, human costs for slightly injured are not included in the Netherlands . Property damage includes damage to vehicles, cargo, roads and road furniture, and to personal possessions. Vehicle damage is always by far the largest cost item in this category  and in the Netherlands these are the only costs included in the calculation (passenger cars, delivery vehicles, trucks and motorcycles). Settlement costs relate to deployment of police and fire brigade in the event of crashes, administrative costs of insurers and legal costs. Legal costs include costs of detection, prosecution, trial and punishment of those who cause a crash and costs for legal aid. In the Netherlands other costs only include costs of congestion resulting from crashes. In some other countries other costs also include cost of vehicle unavailability, such as cost of replacement transport. Approximately half of the total costs are human costs (Figure 3). Also the property damage costs are relatively high (an estimated 30%). Other cost items are relatively low. [i] This is a fairly rough indication of the distribution of the costs in 2015 which is based on the costs in 2009 that are adapted to the number of casualties and to inflation. How do we define human costs of traffic crashes? Human costs of road crashes are costs in the form of suffering, pain, sorrow and loss of quality of life and the joy of life for casualties and the ones closest to them. The intangible damage related with road deaths can be expressed in terms money in a number of steps. The Netherlands and most other European countries do this on the basis of the amount that people are willing to pay for a decrease in the fatality risk in traffic (willingness to pay). This is usually determined with a questionnaire study ('stated preferences'). This can be used to derive the so-called ‘value of a statistical life’ (VOSL). The VOSL is the basis for the calculation of the human costs of road deaths. The immaterial damage of non-fatal injury is in its turn derived from this. In 2001, the VOSL in the Netherlands was estimated at €2.2 ± 0.3 million  . This amounts to nearly €1.8 ± 0.3 million in immaterial damages for fatal injury. The other part of the VOSL concerns consumption loss. Taking into account inflation rate, the VOSL in 2015 was €2.6 million, of which an estimated €2.1 million immaterial damage. This is probably an underestimate, because the VOSL also will have risen due to the general increase in economic prosperity in this period (separate from inflation). The VOSL and human costs do not refer to the valuation for a specific individual, but to the valuation for a decrease in the risk of a fatal crash. After all, most people do not wish to die against any price. The 'willingness to pay' is based on people making a trade-off between risk and money. Every day people take decisions in which they make such a trade-off, consciously or unconsciously. Think for example of the choice of food, choosing driving speed, the choice of whether or not to have a smoke detector, or the decision whether or not to smoke. Much less is known about the human costs of non-fatal injury than about the human costs of fatal injury; studies have only been carried out in Great Britain , Sweden  and Belgium . On the basis of the British study the immaterial damage per serious road injury in the Netherlands has been estimated at 12% of the immaterial damage of a road death . This corresponds to the standard number that is often used at the European level (13% of the non-material damage of a road death) . For slightly injured Europe generally uses 1% of the immaterial damage of a road death  . For more information see the archived SWOV Fact sheet The valuation of human losses of road deaths. The ‘Restitution costs method’ is used to determine the medical costs, the property damage and the settlement costs. This method uses the costs of deployment of people and resources required to (as much as possible) restore the damage for casualties and their relatives. Examples are the costs of medical personnel, the costs of vehicle repair companies and the costs of emergency services. The ‘Human capital method’ is used to determine production loss. This method determines the value of the production that would have been made by the casualties if they were not injured or deceased. Production loss actually includes both paid production and unpaid production (for example, housekeeping and voluntary work). However, in the Netherlands and most other countries only paid production is included in the calculations. The ‘Willingness to pay method’ is used to calculate the human costs. This method usually uses a questionnaire study to determine the amount that people are willing to pay for a certain reduction of the crash risk. Medical costs: number of days that a casualty has spent in hospital, the average cost per day of hospital or nursing home care and the number of ambulance trips per year. 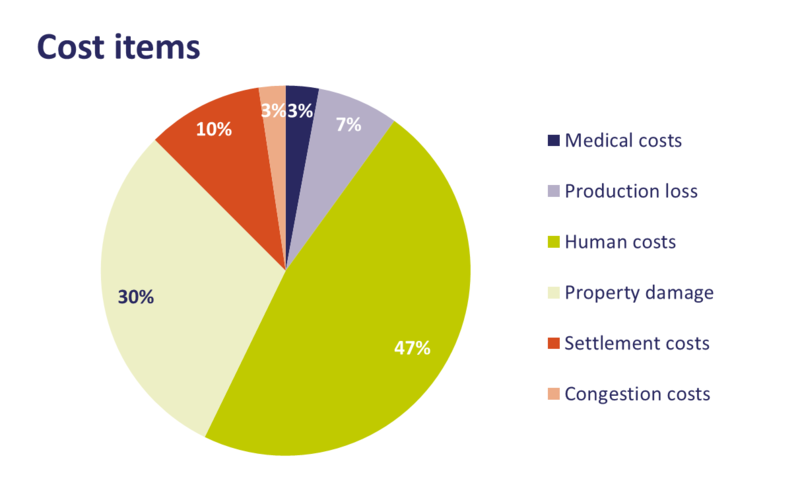 Most medical costs are determined using VeiligheidNL’s burden of injury model, which uses data from medical records and cost estimations from various studies. Production loss: duration of absenteeism and disability, remaining number of life years and production per person. Among the data used are, for example, disability insurance data and economic statistics of for instance Statistics Netherlands and the Netherlands Bureau for Economic Policy Analysis. Human costs: results of a survey about the amount people are willing to pay for a reduced crash risk. Material damage: insurance data on vehicle damage and estimates of damage unknown to insurers due to it not being insured or claimed. Settlement costs: time spent by the police on road crashes, number of times the fire department turns out for road crashes, budgets of fire department and police, financial data of insurers, and number of criminal cases following a road traffic crash. The data is supplied by, among others, Statistics Netherlands and the Ministry of Security and Justice. Congestion costs: number of traffic jams resulting from crashes, congestion intensity thereof (length of a traffic jam times the duration of the congestion) and economic valuation of travel time. How do costs in the Netherlands compare to the costs in other countries? With 2.2% of the gross domestic product (GDP) the Netherlands is among the countries with relatively high costs of road crashes while we occupy 9th place from the road safety perspective (number of deaths per inhabitant) . In Europe, these costs range from 0.4% to 4.1% of the GDP (Figure 4). The costs in the Netherlands are also higher than in Australia and New Zealand (both 1.7% of the GDP), but much lower than in the United States (6.0% of the GDP) . The costs in seven Asian low-and middle-income countries range from 1.1% to 2.9% of the GDP . Figure 4. 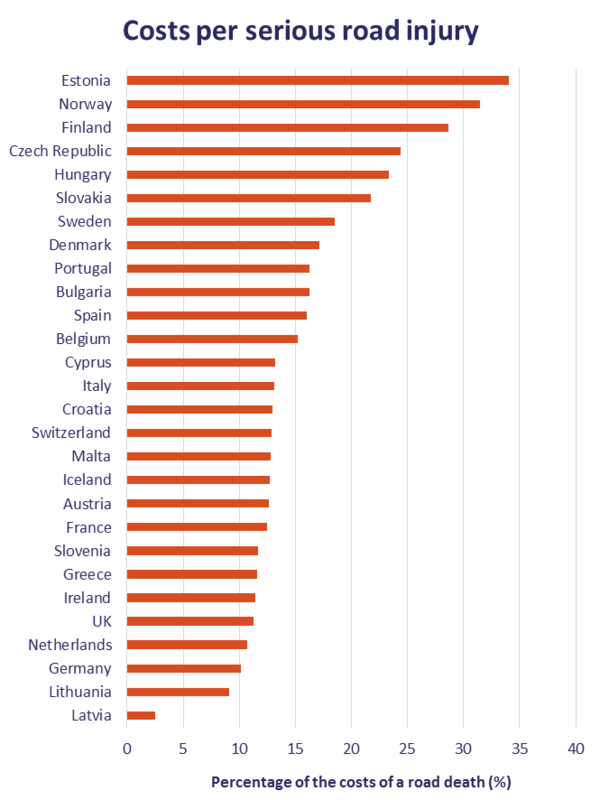 Costs of road crashes, as a percentage of the GDP in 31 European countries . The differences in total costs between countries are not solely explained by differences in the level of road safety, but mainly by differences in the way the costs are calculated, in particular the human costs . Also, there are many countries that, unlike the Netherlands, do not take into account underregistration of casualties and crashes, or do not include property damage only crashes in their cost estimates. Furthermore, countries differ in the cost items they include. As has been advocated by international road safety organisations such as IRTAD, FERSI and ETSC , greater uniformity in the methods used is required for good comparison of the costs of road crashes in different countries. When the cost estimates in European countries are corrected for methodological shortcomings, the costs of road traffic crashes in Europe are estimated at a minimum of 3% of the GDP . Also the costs per road death are higher in the Netherlands than in most other countries. In Europe, these costs range from €0.7 million to €3.1 million (see Figure 5)[i]. In Australia the costs per road death are lower than in the Netherlands, but in the United States they are much higher . Differences are mainly explained by differences in the method of estimating the human costs: in countries that use a 'willingness to pay’ method, among which the Netherlands, these costs are higher    . In most European countries the costs of a serious road injury[ii] are between 10% and 20% of the costs of a road death. With 11 % of the costs of a road death, the costs of a serious road injury are relatively low in the Netherlands (Figure 6). In absolute amounts, there are large differences between countries in the costs per serious road injury; in 2015 these range from €28,000 to €959,000. Figure 5. 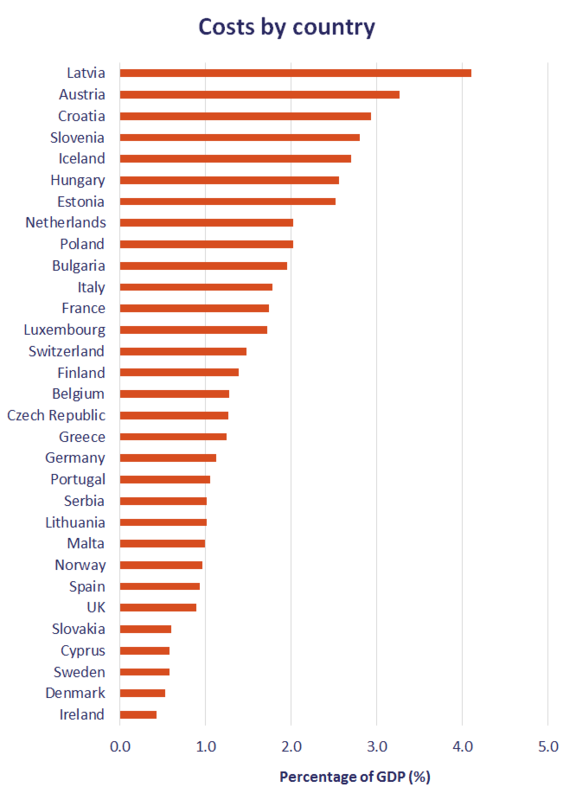 Costs of a road death in 31 European countries (million euro, price level 2015) . Figure 6. 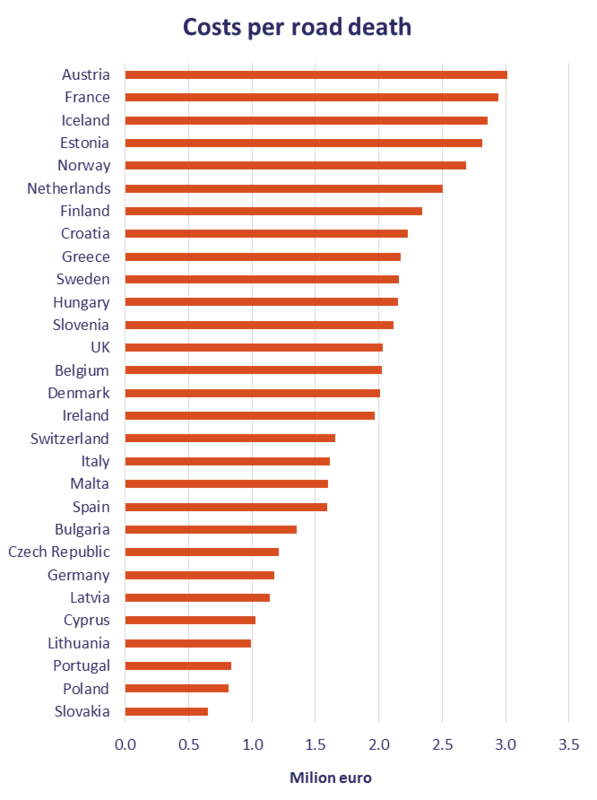 Costs of a serious road injury as a percentage of the costs of a road death in 31 European countries . [i] Due to a correction for differences in purchasing power between countries, the costs per fatality are lower in Figure 5 than the data provided by KiM. [ii] These are the costs of a serious road injury such as defined in each country; these definitions differ between countries. How do the costs compare with other traffic-related costs? The road crash costs of approximately 14 billion euro (€13.0 to €15.4 billion) are significantly higher than other social costs related with traffic: the costs of congestion are estimated at €2.3 to €3 billion (main road network only)  and the costs of environmental damage due to road traffic at €4,8 billion (source: KiM)[i]. Figure 7. Estimated social costs related with road traffic in 2015 (; KiM). Congestion costs are not just the costs of direct loss of travel time, but also the costs of unreliability of travel times, adaptation of travel behaviour to congestion (detours, other times of travel etc.) and indirect costs, such as effects on public transport. Environmental costs are the costs resulting from air pollutant emissions, CO2 emissions and noise pollution, such as costs of health damage and damage to buildings . 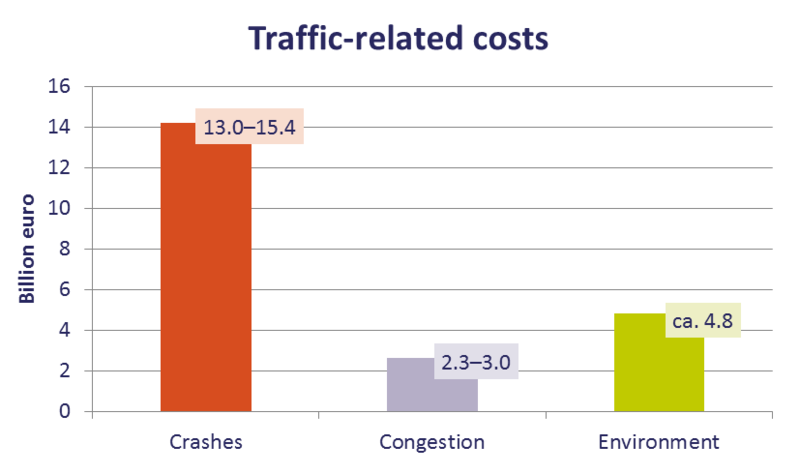 [i] Note: the costs of road crashes, congestion and environmental damage are the costs for 2015. For congestion and the environment, however, the price level of 2010 has been used, for crashes this was the price level of 2015. However, this has hardly any effect on the relative differences in cost. Why is it important to determine the costs of traffic crashes? First, the costs of road crashes give insight in the extent of road safety as a social problem, and particularly in the socio-economic impact of road crashes. They can for example be seen as an indicator for the results of road safety policy, of course in addition to numbers of casualties and other indicators . Information about the costs of road crashes is also commonly used in the preparation and evaluation of road safety policy, both at national level, for example in the Strategic Plan Road Safety 2008-2020  and at the international level, for example in the Policy Orientations on Road Safety of the European Commission . Furthermore, cost information makes it possible to compare costs of road crashes with costs in other policy sectors, in traffic and transport (environmental damage, congestion) as well as in other sectors, such as environmental policy, health care or other sectors of safety policy. Furthermore, information about the social costs gives insight into opportunities for cost savings and can be used to prioritize policy objectives. Finally, also on the level of costs of road crashes making international comparisons is useful, although this requires that the methods used to calculate the costs are harmonized to a greater extent. Secondly, information about the costs of road crashes is used in cost-benefit analyses. These use the costs per casualty or crash to express the road safety effect of policy measures as a monetary value. This value is then balanced against the cost of the measures. What are social cost-benefit analyses? A social cost-benefit analysis (CBA) determines the economic and other welfare effects of an investment, for example, of an investment in road safety improvement. This means that a CBA answers the question whether the benefits of an investment outweigh the costs from a social point of view. Whenever possible, a CBA expresses the effects in money. This is not just the case for road safety effects, but also for effects on, for example, the environment and mobility. In this way a CBA makes it possible to judge the social return of an investment. CBAs of road safety measures often show that the benefits of measures exceed the costs. This is partly because of the high costs of road crashes, and , therefore, the resulting high savings (benefits). Early in 2000, a number of planning agencies  concluded that investments in road safety are cost-effective. The benefit-cost ratio of investments in Sustainable Safety measures in the Netherlands during the period 1998-2007, for example, has been calculated to be nearly 4:1  . International overviews of CBAs   also indicate that road safety measures generally have higher benefits than costs. For more information see the archived SWOV Fact sheet Cost-benefit analysis of road safety measures.
. Wit, M. de & Methorst, R. (2012). Kosten verkeersongevallen in Nederland; Ontwikkelingen 2003-2009. Directoraat-Generaal Rijkswaterstaat, Dienst Verkeer en Scheepvaart DVS, Delft.
. Wijnen, W. & Stroeker, N.E. (2009). Uitgaven aan verkeersveiligheid; Een schatting voor 2007. R-2009-17. SWOV, Leidschendam.
. Wijnen, W., Weijermars, W., Vanden Berghe, W., Schoeters, A., et al. (2017). Crash cost estimates for European countries. Deliverable 3.2 of the H2020 project SafetyCube.
. Kasnatscheew, A., Heinl, F., Schoenebeck, S., Lerner, M., et al. (2016). Review of European accident cost calculation methods – With regard to vulnerable road users. Deliverable 5.1 of H2020 project InDeV. European Commission, Brussels.
. Wijnen, W. (2014). Kosten van verkeersongevallen in internationaal perspectief. R-2014-6. SWOV, Den Haag.
. Wijnen, W. & Stipdonk, H. (2016). Social costs of road crashes: An international analysis. In: Accident Analysis & Prevention, vol. 94, p. 97-106.
. Blaeij, A.T. de (2003). The value of a statistical life in road safety; Stated preference methodologies and empirical estimates for the Netherlands. Tinbergen Institute Research Series. Vrije Universiteit Amsterdam, Amsterdam.
. Wesemann, P., Blaeij, A.T. de & Rietveld, P. (2005). De waardering van bespaarde verkeersdoden; Covernota bij 'The value of a statistical life in road safety'. R-2005-4. SWOV, Leidschendam.
. Hopkin, J.M. & O’Reilly, D.M. (1993). Revaluation of the cost of road accident casualties: 1992 revision. Transport Research Laboratory, Crowthorne.
. Persson, U. (2004). Valuing reductions in the risk of traffic accidents based on empirical studies in Sweden. Proefschrift Lund Institute of Technology, Lund.
. Brabander, B. de (2006). Valuing the reduced risk of road accidents. Empirical estimates for Flanders based on stated preference methods. Proefschrift Hasselt University, Diepenbeek.
. Wijnen, W. (2012). Bouwstenen voor berekening van de kosten van verkeersongevallen 2003-2009; Materiële en immateriële kosten en kosten van afhandeling. D-2012-4. SWOV, Leidschendam.
. Bickel, P., Friedrich, R., Burgess, A., Fagiani, P., et al. (2006). Proposal for harmonised guidelines. Deliverable 5 of the EU project HEATCO. Universität Stuttgart, Institute of Energy Economics and the Rational Use of Energy (IER), Stuttgart.
. Adminaite, D., Jost, G., Stipdonk, H. & Ward, H. (2016). Ranking EU progress on road safety; 10th Road Safety Performance Index Report. European Transport Safety Council ETSC, Brussels.
. Wijnen, W., Schroten, A. & Hoen, M. ‘t (2016). Costs of road crashes in the Netherlands; An assessment of scenarios for making new cost estimates. CE Delft / W2Economics, Delft.
. Trawén, A., Maraste, P. & Persson, U. (2002). International comparison of costs of a fatal casualty of road accidents in 1990 and 1999. In: Accident Analysis & Prevention, vol. 34, nr. 3, p. 323-332.
. Elvik, R. (1995). An analysis of official economic valuations of traffic accident fatalities in 20 motorized countries. In: Accident Analysis & Prevention, vol. 27, nr. 2, p. 237-247.
. Schroten, A., Essen, H.P. van, Aarnink, S.J., Verhoef, E., et al. (2014). Externe en infrastructuurkosten van verkeer; Een overzicht voor Nederland in 2010. CE Delft, Delft.
. Bliss, T. & Breene, J. (2009). Country guidelines for the conduct of road safety management capacity reviews and the specification of lead agency reforms, investment strategies and safe system projects. World Bank, Washington.
. Ministerie van VenW (2008). Strategisch Plan Verkeersveiligheid 2008-2020; Van, voor en door iedereen. Ministerie van Verkeer en Waterstaat, Den Haag.
. European Commission (2010). Towards a European road safety area: Policy orientations on road safety 2011–2020. European Commission, Brussels.
. CPB, RIVM, RPB & SCP (2002). Selectief investeren; ICES-maatregelen tegen het licht. CPB en Koninklijke De Swart, Den Haag.
. Weijermars, W.A.M. & Schagen, I.N.L.G. van (2009). Tien jaar Duurzaam Veilig; Verkeersveiligheidsbalans 1998-2007. R-2009-14. SWOV, Leidschendam.
. CEDR (2008). Best practice for cost-effective road safety infrastructure investments. Summary Report. Conference of European Road Directors, Brussels.
. ROSEBUD (2006). Examples of assessed road safety measures - a short handbook. European Commission, Brussels. SWOV (2017). Road crash costs. SWOV Fact sheet, July 2017, The Hague.